It has travelled all the way from Mersea Island (it really has travelled much further than that, but that's another story for another day), the most easterly inhabited island in the UK, off the coast of Essex, England. It comes courtesy of Juliet and Greg of Black Diamond Accordions, who live and work on the island, hopefully forging a connection between Mersea Island and the Isle of Islay. 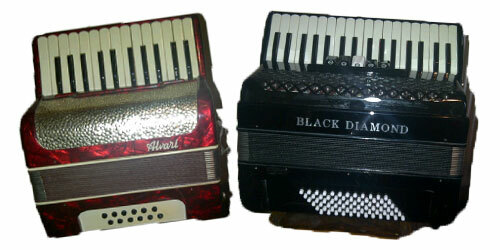 They also run the Black Diamond Accordions Blog, where you'll find a lot about (no surprise there) accordions and in particular accordion music. They are of course also on Twitter, under @BDAccordions, where they heard about the appeal and decided to join in. Juliet and Greg (and I assume their daughter) hope to travel to Islay later this year to see and hear their and other accordions in action, for the music as well as for their lifelong love of the Hebrides. I hope there will be a video of the Islay children playing the accordions to share at some point, until then here are two videos from Juliet and Greg, showing a few impressions of Mersea Island together with some nice accordion music: Sam Pirt plays Tivoli and Sam Pirt plays a traditional Swedish tune, "Der Stod en Jungfru".